Camp Victor | Where have the days gone? On Monday evening after spaghetti dinner in the mess hall, there was a mandatory orientation session for anyone whose first day it was (i.e. us). There they told us how Camp Victor came to be. Christus Victor Lutheran Church is a church on Rt 90 in Ocean Springs. When Katrina hit, the church staff was at the church, and waited out the storm. Only afterward did they realize how bad it had really been. People from the community started coming to the church for help and a place to stay, because this church had always been known as a place of help and refuge in the area. There was no power or telephone service, but one of the staff members' DSL connection was still working somehow (the only one they knew of, and luckily right near the church). So for 15 minutes every 4 hours, he would run his generator to power his modem, and they would send emails out to call for food and help. Meanwhile, the church had become a de facto Red Cross shelter, and in fact this was one of the first times the Red Cross had used a private structure as a shelter. They were able to house several hundred people in the church. Within a day or two, Lutheran Disaster Response had arrived on the scene, and began bringing in volunteers and food and other aid for the hurricane victims. 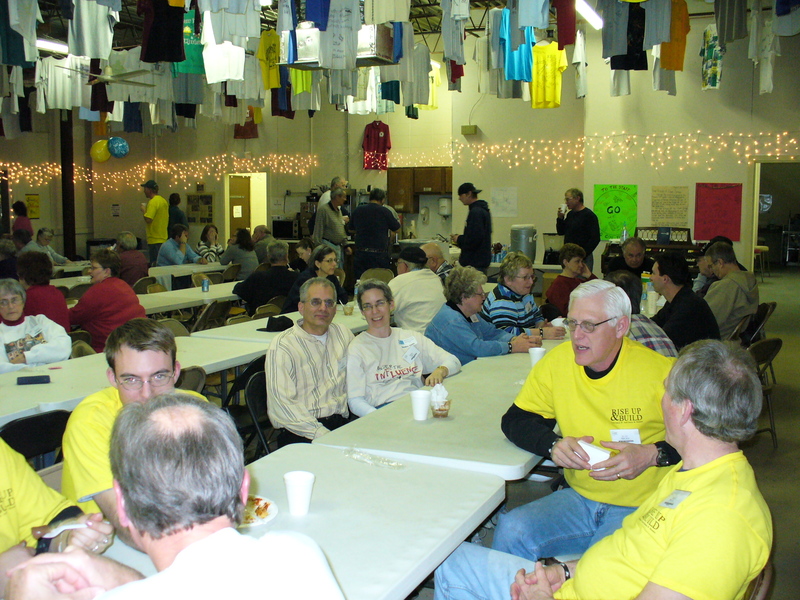 After the crisis period had ended, LDR stayed and set up a work camp at the church, with 200 volunteers per week coming in from all over the world to donate their time to the clean-up effort. Our Synod sent 3 groups for a week each last February, and they stayed at the church. The church was also running a distribution center to distribute food and supplies to the people, and a medical clinic to treat those who were not injured seriously enough for the hospital to see them (the hospital was having to turn people away). At some point last Spring, the church purchased a warehouse building in downtown Ocean Springs, and volunteer workers converted it into Camp Victor, with a distribution center, staff offices, 6 dormitory rooms, a mess hall, showers and restrooms, a medical clinic, and a large area for construction tools and supplies. The emphasis now is on reconstruction rather than demolition and cleanup, though as we're finding, there are still houses that need to be "mucked out" after 17 months! Work is being done in Ocean Springs and a number of neighboring towns. About 100 families are assisted by the distribution center each week. LDR is still the agency running the operation, and they believe they will be needed here for another 3-6 years. Lutheran Disaster Response is well-known for being among the first to arrive at a disaster area, and among the last to leave. Over 8,000 volunteers have served at Camp Victor since September 2005; approximately 150-200 people still are coming to help every single week. Over 1400 homes have been worked on, with another 400 on the waiting list. 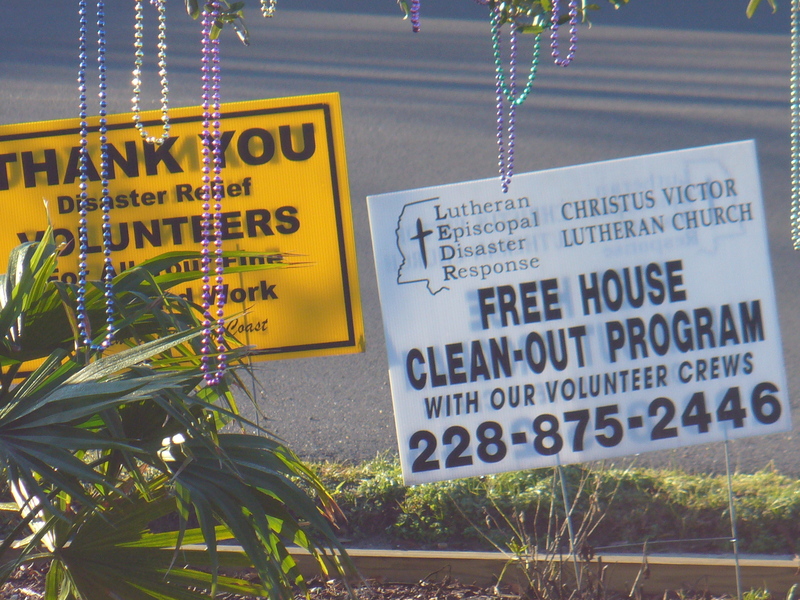 Anyone can call to request cleanup assistance; from what I can gather, in most cases the homeowner pays for the materials, but in some cases not, and in any case the labor is all free. Priority is given to the handicapped and the elderly, since they are the least likely to be able to rebuild their homes by themselves. People from all walks of life are here helping: many are in home construction by trade, but most are just willing hands. This week I would say that about 2/3 of the volunteers are men, and I imagine that's typical. Many are retired, but there are also many who clearly are taking a week's vacation to help others. Besides our group of 75 from Southwestern PA, there are large-ish groups from Wisconsin and the Dakotas here this week, as well as small groups or individuals from about a dozen other states. It's truly inspirational to see so many people so willing to give of themselves to help their "neighbors". If you'd like to help by donating time, money or material, please see the Camp's website. We can attest to the fact that all donations are very welcome, and definitely put to good use.